The Philippines is a world-class diving destination. The islands have one of the most productive marine ecosystems in the world, a wonderful diversity of more than 800 types of colourful corals, and a vast array of marine life that exists beneath its deep blue waters. 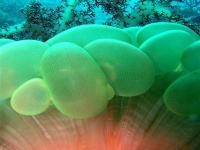 There are a multitude of dive sites throughout the islands that suit either beginners or expert divers. The best known dive destinations are Batangas, Boracay, Cebu, Mindoro and Palawan, most of which are within easy reach from Manila. For complete novices, it is a popular tourist activity to attain a diver's license while on holiday in the Philippines - a great way to return home with a skill you didn't have when you left. Finding good quality wetsuits and scuba equipment for hire is generally very easy in the Philippines as the main dive destinations are very popular. If you want to bring your own equipment, a 3mm to 5mm short or full wetsuit is ideal. All qualified divers must bring their certification cards and logbook, and those planning to do diving courses will need to fill out a medical declaration; if you have any health issues it is best to bring along proof of medical clearance from your doctor. Diving is possible year-round as the water temperatures are always pleasant, but the sea is warmest between May and July and coolest between December and March.